We love our young uniform activists! 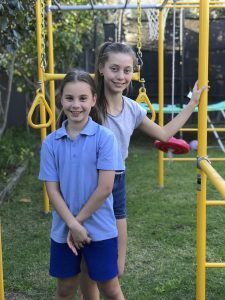 There’s no doubt that they are change agents – transforming their school uniform policies so girls at their schools have the choice of wearing pants and shorts as their everyday uniform. 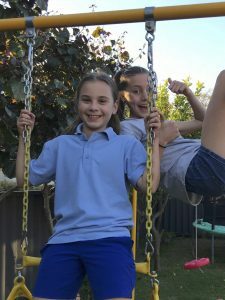 This is a great story of how Sofia, our dynamic young uniform activist from WA, inspired 10 year old Lou Lou. Lou Lou was so impressed with Sofia that she gave a speech for a public speaking competition talking about Sofia’s advocacy. We’re always excited to hear about how our young uniform activists inspire change and we’re so pleased to have Lou Lou become part of our campaign. Thanks Sofia and Lou Lou – you two rock! “Today I am going to talk to you about a change agent lots of you know…Sofia Myhre. Sofia started at our school in kindergarten. By the time she got to year 3 she wanted to wear her sports shorts everyday instead of a skirt or dress. She liked shorts more because she felt more comfortable running jumping and playing in them than the skirt or dress. And the boys were allowed to wear shorts everyday so why wasn’t she…? By the time she got to year 6 Sofia and her mum decided to ask the Principal to allow girls to wear shorts everyday as part of the school uniform. To their surprise the principal thought that the girls looked more presentable when they were wearing skirts and dresses. This made Sofia and her mum think…was it more important that girls look presentable and neat or was it more important that the girls feel comfortable just like the boys…? Recent research has shown that girls are far more active at school when wearing shorts or pants. Don’t we want all kids to be more active? Isn’t it a no-brainer for girls to wear shorts or pants just like the boys. Women are allowed to choose what they wear to work…they are not told to only wear skirts or dresses. Sofia and her mum didn’t give up. They wrote to the school board and the principal to share their hopes in adding a girl’s shorts option to the school uniform. After lots of persistence the school came around and added in some great new shorts that the boys and GIRLS can wear everyday. Sofia was super excited that her school had changed the uniform policy. But it started her thinking about all the other girls in WA who still didn’t have the choice. So Sofia took her stand to the Education Minister of WA Sue Ellery. She wrote a handwritten letter to the minister, telling her how she loved going to school but that she disappointed when was didn’t have the option to wear shorts everyday. It turned out that the Education Minister agreed with Sofia. She changed the State’s student dress codes policy to make it “non-discriminatory”.